In “Using LinkedIn Company Pages for your Local Business,” my article last week, I explained how to create and update a LinkedIn company page, which is the first step to using LinkedIn’s sponsored updates and other advertising services. 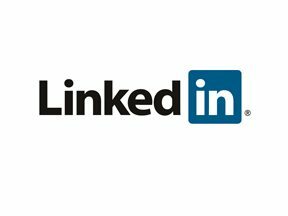 As I noted in “Using LinkedIn to Attract Consumers, Prospects,” LinkedIn is the world’s largest business network with roughly 300 million members in more than 200 countries. LinkedIn’s overall audience is small compared to Google. But, unlike Google, it allows businesses to achieve precise targeting, including industry, geography, company, job title, role in the company, and even membership in LinkedIn groups. LinkedIn advertising is self-service. It allows you to create and place ads within LinkedIn based on your targeting options. LinkedIn members can click on your ads, follow your company page, and visit your website. You control your advertising budget, including paying by clicks or impressions. Another benefit of running LinkedIn ads is that you do not have to be directly connected to an individual or have advertising targets in your network. In short, LinkedIn advertising can generate meaningful results if managed properly. In this post, I’ll explain how to build a LinkedIn advertising campaign. The first step is to reach the advertising section of LinkedIn. Do this by hovering over the “Business Services” link in your profile’s top navigation, as shown below. Then click on “Advertise” from the drop down menu. In the LinkedIn Ads home page, click on the “Get Started” yellow button, which will be followed by LinkedIn asking you to log into your account’s management section. In this article I will focus on Sponsored Content, which uses updates from your LinkedIn company page. 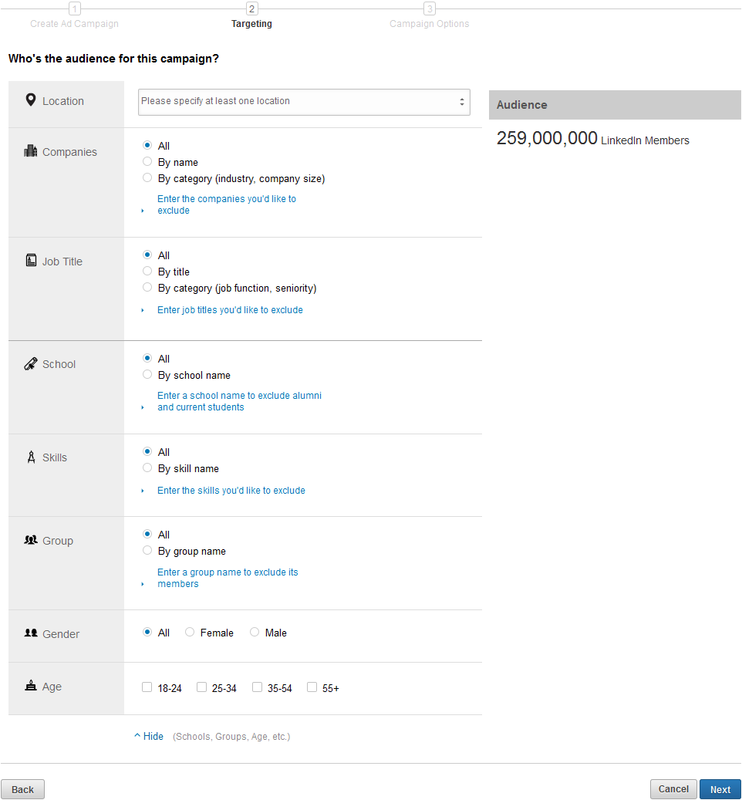 Once you select the “Sponsor Content” box and click the “Next” button in the lower right, the LinkedIn campaign manager will appear, as follows. Once you complete the four questions (below), you will see a preview of the update you wish to sponsor. You can then click the blue “Next” button in the lower right corner. Click on the update you wish to sponsor (you will see a list of updates you have posted to your company page and you can select the one you for this campaign). The targeting options provided by LinkedIn include how wide of an audience you prefer, as follows. The last step is to determine your budget and program type. 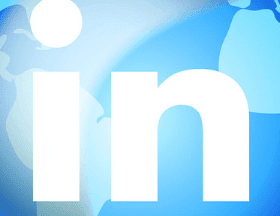 LinkedIn offers two methods: cost per click (CPC) and cost per 1,000 impressions (CPM). For first time campaigns, go with a CPC program. In my experience, the CPC program is more expensive that CPC at Google. But remember you are targeting a very niche group, using a targeted ad, and a relevant landing page. You should therefore experience a better return on investment. The three budget options to select include the following. Select CPC or CPM and enter your bid amount. Enter your daily or total budget for the campaign. Select an end date for your campaign. To the right of the budget options, LinkedIn provides not only a confirmation of your targeting (top right), but below it your budget details. In the example below the targeting was so specific the minimum bid option from LinkedIn started at $3.50 per click. 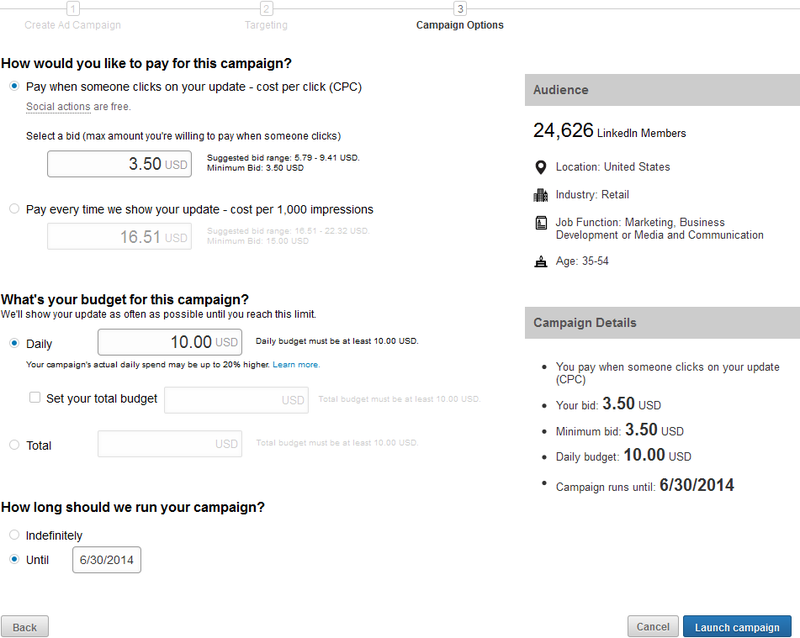 Depending upon your campaign targeting selections, you will see your minimum budgets vary from LinkedIn. The last step is to click the “Launch Campaign” button in the lower right corner. If your profile has a credit or debit card established, the next page will provide the statistics of your campaign and a list of your campaigns at the bottom. 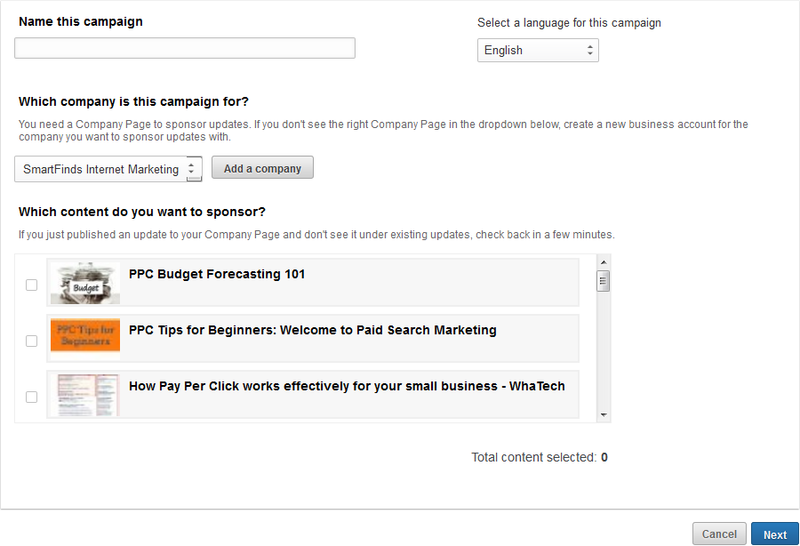 The Linked sponsored updates will show in all areas that you have selected in your targeting options. This will likely be in a member’s home page feed and the groups you selected. Sponsored updates can be shown in any position member’s home page feed. There is no fixed position. Rather, they are embedded among other updates. LinkedIn decides where sponsored content appears, to balance a positive member experience with performance for advertisers. One quick note, two sponsored updates from advertisers will never show above or below each other. LinkedIn’s algorithms determine how many times a member will see your sponsored update in one day and over a set period of time. Sponsored updates are shown to LinkedIn members when they visit their home page feeds. If the members’ feeds refresh, other sponsored updates can appear. LinkedIn provides a robust amount of statistics about your ad campaigns. Be sure your Google Analytics account is set up to track activity from LinkedIn into and through your website for any visitors coming from the LinkedIn campaign. While there are over 15 metrics you can review from your campaign, here are a five, below. Clicks. The number of clicks on your content, company name, or logo. This doesn’t include social actions, such s shares, likes, and comments. CTR. The number of clicks divided by the number of impressions. Engagement %. The number of social actions plus the number of clicks, divided by the number of impressions. Impressions. The number of times each update was seen by LinkedIn members. Social actions. The number of times people have liked, commented on, and shared each update. Most advertisers in LinkedIn see good results. However, experiences differ based on the targeting options. If you have tried LinkedIn advertising, please share your experiences, below.